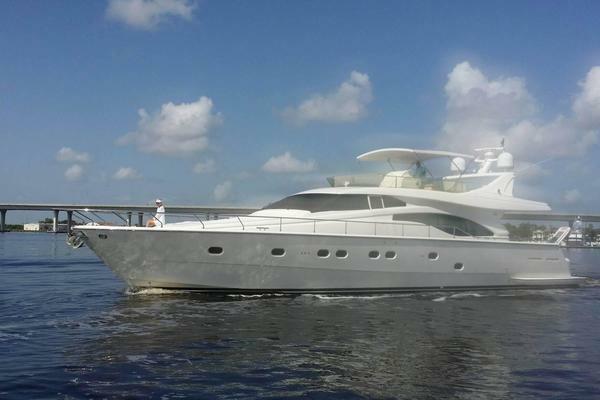 This 1996 Azimut 70 Sea-Jet was designed and set up for travel to the Bahamas, Caribbean, or Mediterranean. This vessel is in exceptional condition with new bottom paint, new props tuned and balanced, new zincs installed, and trim tab cylinders rebuilt. She also comes with a new Avon Inflatable Tender stored by electrical winch in the aft garage. The abundance of surrounding windows serves to underscore the solid cherry woods, exquisite Italian leathers and fine fabrics, which makeup the salon’s decor. A mirrored panel with 3 acrylic shelves for displaying décor items and glassware is positioned in the aft, port side corner of the room. An icemaker and pull out storage unit are in a cabinet below. The private stairs to the master cabin are directly across to starboard. Outboard walls are flanked by curved leather sofa and facing settee with emphasizing rope lighting. A custom expanding coffee table sets in from of the larger sofa . The leather and burl wood overhead inset mimics the furniture layout and has rope lighting in the cove area. Additional outstanding notables include: Cruisair SMX A/C controls, coordinating roman shades, fabulous joinery work, striking wood cornices, pillars, custom wet bar and icemaker, and TV/DVD/ stereo unit cunningly hidden behind tambour doors beneath the galley granite bar top. Divider doors, again in tambour, above the bar top can close off the galley and serve as an additional design element matching the wood patterns throughout the space. Descending the curved staircase directly forward of the Lower Helm, the VIP and Guests accommodations also provide gently curved lines and warmth through the use of cherry wood and burl paneling. The full width Queen VIP Stateroom's overhead is a mixture of cherry wood and alcantara accented by diffused lights within the recessed features. Noteworthy are the lighted vanity with lift up storage, drawers, cabinets, coordinating stool to port, two person settee with below storage with cabinet storage above is on the starboard side, two night stands and hanging closets flank the centerline berth, mirrored bulkhead behind the bed, additional cabinets, and stainless porthole behind roman shades. The air conditioned starboard side VIP Head showcases a vanity with cabinets below, a bull nose marble countertop and under mount sink, and top of the line fixtures. In the forward corner is the shower with curved plexiglass sliding door and four-fixed body sprays and fold down seat. Also included are an up-graded toilet (larger than standard), two linen lockers, opening stainless porthole beneath drapery, a large mirror, and up-graded marble sole to match the countertop. The engine air intakes are mounted laterally at bridge level to ensure top engine performance, while engine exhausts are underwater to provide the minimum noise. Fresh water cooling mains; closed cooling Cruisair air conditioning system-88,000 BTU Spare air conditioning pump (not installed) 5-zone air conditioner; Village Marine Squirt SPW600+ gallons per day water maker, bow thruster, engine synchronizers trim tabs hydraulic steering, new auto fire extinguishing system, alarm system w/ fire sensors 4 bilge pumps with high water alarms, bilge blower, engine hour meter fuel shut-off valve and spare propeller. Teak decks, bow pulpit and rails, stainless handrails U-shaped stainless handrails-swim platform, Marquipt sea stair with attachments fore and aft-both sides, wash down system Bimini top, windshield wipers with washers, 3electrical wipers on forward windows deck sun pad bridge weather covers - all seats and helm, custom cover for aft deck table, transom shower, anchor with lines, Lofrans windlass- aft and bow chain storage with drain and washing chain pump, fenders and lines. For further information about this 70’ Azimut yacht, please contact us via telephone or via email.